Aldi has been making the headlines for all the right reasons lately, while many of its longer established UK rivals have been struggling. 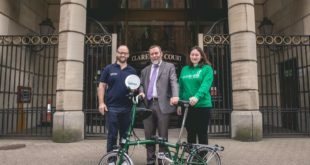 Now the firm has boosted its PR stock further by becoming the first supermarket to sign up to the #ChooseCycling network. Set up earlier this year, the ChooseCycling network includes big businesses like the AA, Sky, Orange, National Grid and GlaxoSmithKline. The national group works with British Cycling and other cycle organisations and meets twice a year to discuss news and innovative ways to promote the cycling agenda. Aldi will now encourage thousands of its employees across the UK to get on their bikes and cycle to work as part of its established cycle to work scheme. The supermarket currently employs 28,000 people in the UK and plans to create 35,000 new jobs by 2022 as it expands it store numbers and supporting network of distribution centres and offices. Graham Hetherington, regional MD at Aldi, said: “The success of the Great Britain Cycling Team is world-renowned and has helped turn Britain into a nation of cycling enthusiasts. Aldi is a keen supporter of British sport and through partnerships such as this and Team GB we are aiming to encourage people to be fit and active. Martin Key, campaign manager for British Cycling, said: “It’s great to see the momentum now being generated by the #ChooseCycling network. The profile and the influence of the companies we now have on board is fantastic, and shows the appetite for real change amongst businesses, their employees and the customers they serve. The support for cycling show by the big businesses in the #ChooseCycling network is hoped to encourage the government and political leaders to support cycling.